For Luther, the call of God to “thank, praise, serve, and obey” Him is the clear and obvious response to everything God does for his people. As Christians, “this is most certainly true” for us as well. We, who live a life of faith and trust in God, recognize that He is the source of all the good things that have been entrusted to us. The call to thank, praise, serve and obey our Lord is central to what biblical stewardship is all about. There was once an itinerant preacher who was moved to collect a special offering to help his home church that was poor and struggling. He shared their story with the different churches to which he was preaching. One church heard the message and promised to make a collection. As he moved on into another area, the churches there were so touched by the need that they were very generous in their offering. It was actually a surprising generosity because they were going through a severe time of challenge in their own right. The preacher was amazed at their response because they actually had begged him for the privilege of being able to give and be a part of this support. He decided that he had better communicate with the earlier church that had promised to give. He did not want them to be embarrassed by this generous response if they had not ever gotten around to actually collecting an offering. His letter provided some helpful basic insights around stewardship and giving. You have a copy of this letter. The specific portion that relates to this story is in II Corinthians chapters 8 and 9. The home church was the Jerusalem church that was suffering deep need. Paul reminded the Corinthian church that they were only being asked to give based on what they had (but keeping in mind the willing generosity of the Macedonian churches who found it in their hearts and faith to be generous even in a time of affliction). Paul reminded them that there was no compulsion to this. It was not a requirement. It must come from their hearts and their faith even as it did for the Macedonians. These two chapters are a gold mine for stewardship study and growth. Do we live with a perspective of scarcity in God or abundance? Do we think that all that we have belongs to us or that it belongs to God? Do we find giving of ourselves to be an obligation or a privilege? Is giving of ourselves a matter of duty or an experience of delight? What are you thinking? Where is God leading? 1. Called into Faith – Called into Life Together – Called into the World: This Stewardship Resource is designed to be a one-stop shop for doing an Annual Stewardship Campaign in your congregation. This is the fourth year that we have provided this type of tool. It contains examples of congregational letters, bulletin inserts, a planning worksheet to organize your campaign, a giving chart, an example of an estimate of giving card, a list of additional people and places you can consult regarding stewardship, and the graphics for this year’s theme. New this year are preaching and teaching ideas for the last three Sundays of October and the first three Sundays of November, an example of a time and talent form and some helpful hints for creating a ministry opportunities booklet. This booklet was available to be picked up at the synod assembly. Those not picked up were mailed to the congregations. The booklet is also available on the synod website. 2. Called into the World – Congregation Council Devotions 2012-2013: This is a resource upon which many congregation councils have come to depend for their opening devotions. This year’s version includes stories of mission from in and around our synod congregations. We hope that these stories will be mission stimulators that might provide new ideas for your councils as they work to carry out the Great Commission of our Lord. 3. 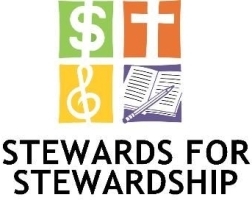 Stewards for Stewardship Training (Saturday, September 15, 2012): Have you ever thought it would be helpful to have someone in your congregation trained to lead an annual stewardship campaign? What if they already knew the key biblical passages that support stewardship ministry? What if they already had a plan of how to guide a year-round stewardship education program? What if they were already provided with useful stewardship resources that have worked in congregations across the country? The Stewardship and Financial Support Committee is sponsoring again this year a special stewardship training to provide a Steward for Stewardship for every congregation in our synod. The second of this year’s workshops will be held on September 15, 2012 from 9:30 AM to 2:30 PM. Dr. Marty Stevens, of the Lutheran Seminary at Gettysburg, will be our speaker again. The location will be St. John’s of Highland Lutheran Church, 311 Cumberland Road, Pittsburgh, 15237. The only cost will be for a catered lunch ($8.00). You may send one person, a team of lay persons, and even the pastor is welcome to accompany them if she or he so chooses. You can come to this even if you missed the first one in April! To register, contact me, Pastor Blair Morgan, at the Synod Office by e-mail (blair.morgan@elca.org) or by phone at 412-367-8222 by September 7. The season for lifting up stewardship in many congregations has arrived! Fall stewardship campaigns will be springing up across the synod. How will you respond to the invitation to offer a portion of your treasure toward the ministries of your congregation in 2013? Even if you happen to be part of a congregation that is not having a specific campaign, it is still a question that you should prayerfully be considering. This is true whether you are lay or clergy, active or less active, adult or youth, retired or still in your working years. Growth Giving is an important consideration for you. Every Christian should prayerfully and yearly evaluate what they are giving toward the mission of God's kingdom. What we give should have an impact on what we spend on everything else in our lives. Our priorities are off center when what we spend on everything else defines what we have left to give to the work of God's kingdom. Growth Giving is a way to make sure that we have these priorities in the right order. Do you know what percentage of your income you give for God's work, especially through you local congregation? Is there a percentage that you would like to reach? Biblically, the tithe (10%) has been a number used by congregations for years as a goal for giving. Lets just see what sort of giving 10% would involve. If you give $10 a week, to be a tither, you would be making $5,200 a year. If you give $15 a week, to be a tither, you would be making $7,800 a year. If you give $50 a week, to be a tither, you would be making $26,000 a year. Pretty easy math then shows that if you give $100 a week, to be a tither, you would be making $52,000 a year. Many people tithe. Interestingly enough, it is often people who make less money who find it possible to tithe. Maybe they don't have enough to have become caught up in what money can do to us. Jesus said, "For it is easier for a camel to go through the eye of a needle, than for a rich man to enter the Kingdom of God." Growth Giving just calls us to start where we are in our giving and figure out what percentage that is. Then, each year, increase our giving by 1% toward the percentage goal that we feel led to by the Lord. Maybe it is time for you to consider Growth Giving. It could actually change your life and your walk with God. "For where your treasure is, there your heart will be also." The fall Stewards for Stewardship training event took place on Saturday, September 15. The Rev. Dr. Marty Stevens of Gettysburg Seminary did a wonderful job of helping us work through how we might plan a year-round stewardship emphasis. Twenty-five congregations were represented and over 50 people attended. We were blessed and learned a lot. One of the recurring themes that Dr. Stevens provided us in both the spring training and this fall event was the difference between God’s sense and focus on abundance in creation and the human sense and focus on scarcity. It seemed worth highlighting here this month. God sees what is while we see what isn’t. God sees the forest while we see the trees. God works with what God can do while we only tend to work with what we can do. God sees the possible even as and where we see the impossible. One way the Dr. Stevens shared this perspective with us was through a discussion of the opening chapters of Genesis. She took our thoughts on these verses and built toward the opening half of chapter three and the temptation story. She made the comment that went something like this, “Just think of all of the trees and fruits that were available to Adam and Eve at that point, but they got caught up in wanting the one tree and the one fruit that was forbidden. There are so many situations in our lives where we have so much available to us, but we get caught up in a focus on what we do not or even cannot have! This is a wonderful stewardship/discipleship reminder for our journeys through life with God. Do we really know how blessed we are? Do we ever really stop to think about all with which God has blessed us? Do we do it personally? Do we do it as congregational leaders regarding our congregations? It is so important to being good stewards to keep a clear perspective on this reality of God’s abundance and our tendency to get caught up in scarcity thinking. “When you are worried and you can’t sleep, just count your blessings instead of sheep. Just a thought for all of us who can get a little too caught up in what isn’t, rather than what is! Three themes of this holiday season arise that are connected to ideas on stewardship. First comes the powerful encouragement to be thankful. It comes across our culture at the end of November in the holiday of Thanksgiving. While children are often encouraged to tell someone thank you for a gift with the words, “What do you say?”, Thanksgiving is a holiday that seems to nudge an entire nation with those words. For what are you thankful? Stewardship is a lifestyle of thanksgiving. Christian disciples seek to leave behind the world’s lifestyle that embraces an ownership perspective with the thought that all that we have belongs to us. We seek to live with the life approach of being good stewards who see that all that is under our care belongs to God. We do not earn it. It is all gift. We make the best use of all of these gifts to the glory of God. So, Thanksgiving is such a great holiday for thoughts that encourage our stewardship. Next comes the special – even unique – season of Advent when we focus so specifically on the “already, and the not yet” of our faith. Yes, we are thankful for all with which we are blessed in Christ. But, we are also a body of believers on alert – peering at the horizon – living in anticipation and hope for what is to come. Stewardship takes seriously this aspect of time appreciation. Disciples of Jesus Christ live thankful for the solid foundation provided by all that God has provided in the past. We live in the moment – being faithful right now – using all of our gifts to focus upon what God is revealing and calling us to in this unfolding present. And we live with great hope in our hearts, knowing that there is even more in store for us in the full presence of our Lord that is coming “soon and very soon,” as the hymn leads us. Finally, there is the amazing, gracious moment of the Emmanuel child’s birth. God’s Word has been made flesh. God is present among us. Hope. Peace. Joy. Love. Grace. Light. Comfort. Healing. Rebirth. These themes that inspire and encourage us become real again each December as we celebrate the truth of “God with us” in the birth of our Lord Jesus. Stewardship embraces the Grace Alone aspect of our faith in the Christmas season. This sense that we have a God who actually cares enough to come to us, to be born with us, is an amazing gift of grace. It fills us in this season. It spills out beyond us into the world. The world doesn’t understand it all, but finds the idea of gift, of joy, of peace and of love contagious. There are many moments when stewardship takes on an evangelical mission aspect in this season. It is not found in the opportunities to scold those who are not seeing Jesus in the joy. It is in the special moments that are provided by the Holy Spirit to gently and lovingly give an account “for the hope that we have within us.” (I Peter 3:15,16) It is the opportunity the season provides to use our gifts for the building up and care of others. It is the opportunity so many embrace to give a little extra of our treasure for the needs of our neighbors. Quite a holiday season of opportunity for growth in stewardship! "Our share" and "God's share"
Ten apples; Ten bananas; Ten oranges; Ten heads of lettuce; Ten peaches; ;Ten sides of beef (not really, just testing you); Ten potatoes; Ten cookies. The pastor introduced the concept of tithing with the kids, then went about making two piles - one representing "our share" and one representing "God's share." "What do you think about these two piles?" the pastor asked. "That one is really big," said the kids, "but that one is kind of small." Then, the pastor gave each kid ten dimes, with no further instruction, and sent them on their merry way. The congregational tellers had to sort through a lot more dimes than usual on that day. It's an effective children's message—probably more effective than most of the stewardship sermons I have ever heard. But there is one rather unhelpful "hidden message" in the above children's message. Hidden in the concept of "God's share" and "our share" is the misbegotten notion that we are done thinking about stewardship once we have tithed. That we are done thinking about God's will and God's ways once we have written our checks to charity. What if God cares as much about the 90 percent that we do not give to charity as God cares about the 10 percent that we do give? Maybe God might want to say something like the following to us: "You are not done with me once you give away the first 10 percent. In fact, you are just beginning. I am just as interested in how you spend and use the rest of the good things that I give you." How can we invite the people of God to imagine God as involved in the other 90 percent? Does God care as deeply about how much we tip as God cares about how much we put in the plate? Does God care as much about how and where we invest our accumulated wealth as how we first acquired that wealth? If you could put a radioactive tracer on every dollar that passes through your checking account and follow those dollars around for a month, how many lives would those dollars touch? What stories would those dollars tell? And which story might tease the broadest smile out of God? Does God care about on what we spend our money? It is fun to think about these questions. It is even more fun to live these questions. To entertain these mysteries. To wonder with other baptized and forgiven sinners, "Now that I belong to God, how shall I live with all these belongings?" There are stories across this church of ways that money from an estate have inspired new ministry. I know of cases where a small gift of a thousand dollars or two has made a difference. I know of cases where gifts of hundreds of thousands or more than a million have made a difference. It is a simple thing to include your congregation in your end of life planning. Of course, the key is to actually make some end of life plans! It is likely that a significant portion of the people reading this article will answer “NO” to that question. They will not have made any plans, created a document on their own, or talked with a lawyer. The irony is that everyone can answer “YES” to that question! This is because whoever does not make out their own will, the government has a basic process for how your estate will be handled! If you do not make out a will, the government has one for you. Everyone has a will, but not everyone has a plan in place. Many are just leaving it up to the basic laws of the state. So, could it be about time to consider creating a will and including your local congregation in your estate? It is a good plan – for you, for your loved ones and for those that might benefit from your willingness to share something significant from your life’s financial wealth. It has crossed your mind. You have thought about it. You may have talked about it at some point with your loved ones. The time has finally come to DO something about it. As I began to share on the opposite page, this year’s “Stories of Faith in Action” from the ELCA is a wonderful resource to learn about mission and to inspire stronger stewardship in our congregations. There is a section entitled “WE ARE A CHURCH THAT BELIEVES JESUS IS GOD’S YES TO US. OUR LIVES CAN BE A “YES” TO OTHERS.” It tells three stories of ways this has been especially true in Massachusetts, Minnesota and Montana. In Massachusetts a congregation called “Cathedral in the Night” meets every Sunday evening for a warm meal and worship. This gathering includes people who have been rendered homeless as part of this new congregation in development. In Minnesota urban congregations partnered with St. Olaf College to hold their Vacation Bible School at the college. Young people who are growing up in contexts where college education is not emphasized were provided an unusual chance to experience a college campus as part of their VBS experience. In Montana there is an ELCA congregation in the Montana State Prison. About 50 congregations of the ELCA Montana Synod began the ministry. The vision has been to provide a stable Christian context in the midst of a population that experiences very little stability in other ways. These are just some of the stories that are shared underneath wonderful titles about mission and how our church makes a powerful difference for the Gospel of Jesus Christ in this world. When you and others in your congregation place an offering in your offering plate, a portion of that offering reaches out across the world through what we call in the ELCA – Mission Support. You place a dollar in that plate and certainly 80 to 95 cents of it supports ministries right there within the life of your congregation. But, your congregation also sends a portion of that – the synod has set a goal for 12% of a congregation’s expenses to go to Mission Support – to reach out through the ministries of the synod and the ELCA. Ministries across our corner of Pennsylvania are reached. As you saw above, ministries are reached in different corners of our country. “Stories of Faith in Action” also reminds us that we reach ministries in places like Indonesia, Liberia and the Republic of China. We support seminaries and colleges of the church. We reach out to other denominations and religions. It is an amazing mission impact that your gift into that offering plate provides. People are reached in ministry for Christ across the street and across the world! Have you ever thought it would be helpful to have someone in your congregation trained to lead an annual stewardship campaign? What if they already knew the key biblical passages that support stewardship ministry? What if they already had a plan of how to guide a year-round stewardship education program? What if they were already provided with useful stewardship resources that have worked in congregations across the country? The Stewardship and Financial Support Committee is sponsoring once again a special stewardship training to provide at least one Steward for Stewardship for every congregation in our synod to meet this exact need. This training will enable these Stewards to be equipped to faithfully and successfully lead the stewardship ministry in a local congregation. This can be one person or a team of people from each congregation – the more the merrier! 50 congregations have participated over the last two years and gave energetic and positive feedback about the value of these workshops for their congregations. Each year we offer two events focused completely on training people to be faithful stewards of their congregation’s stewardship ministry. The first workshop (held in the spring) lays the groundwork for a strong biblical understanding of stewardship ministry through the study of a myriad of Bible stories and passages relating to stewardship. The second workshop (held in the fall) provides helpful, practical examples of ways to strengthen stewardship education in the life of a congregation. The first of our two workshops will be on Saturday, May 4 and will be led by our bishop, the Rev. Kurt F. Kusserow. The time for the workshop will be from 9:30 AM to 2:30 PM. The location will be St. John’s of Highland Lutheran Church, 311 Cumberland Road, Pittsburgh, 15237. The only cost will be to cover food and drinks. We will have fruit and donuts available with coffee and tea as you gather. Also, a catered lunch will be provided. The suggested donation for this is $8.00. Remember, you may send one lay person, a team of lay persons, and the pastor is welcome to accompany them if she or he so chooses. To register contact Pastor Blair Morgan at the Synod Office by e-mail (blair.morgan@elca.org) or by phone at 412-367-8222 by April 26. There are times when I really search through materials to come up with something useful for this space each month. Other times the article just writes itself. This month the latter is the case! I recently learned of a website produced by The Episcopal Diocese of West Texas that provides a multitude of resources around stewardship. It is organized by months so that there are ideas for stewardship available and resources highlighted for every month of the year. We are accustomed to thinking of stewardship in terms of the annual "pledge drive." It happens once a year, and mostly we endure it as a necessary evil to raise money to run the church. But stewardship is not an annual "event" we hold in October. Stewardship is what we do with all that God has given us, all the time. This calendar takes stewardship out of the "annual occurrence" category and places it where it should be - right in front of us, all year ‘round. The calendar gives congregations suggestions and resources for practicing year ‘round stewardship. Each month, the church season is explained and a theme is identified around which individual and congregational activities might take place in five recurring categories: Spiritual Growth, Ministry Spotlight, Financial Health, Outside Ourselves and God's Creation. To get it started, we are identifying a theme for each month, along with resources and suggestions for implementing the theme in each category. But this is only a starting place. Use as many or as few of the suggestions and resources offered. Be brave - and creative - and custom-fit the ideas to your congregation. For instance if the calendar suggests thanking your music ministry team and you don't have a music ministry at your church, take this is opportunity to raise that awareness in your congregation and think about what you need and how you can accomplish it. I have not read through the entire website – it is quite comprehensive. But, as I have sampled different months, I have found it to be a wonderful and challenging resource worth your perusal as you consider how you might strength your congregation’s year-round stewardship ministry. There are times in the life of a congregation when there is a need to seek an outside resource to guide the stewardship process. It may be because there is a new ministry or additional staff person that is about to be added and the congregation needs to take a strong look at how much it is giving. It may be because there is a major property challenge to be embraced – building a new building, making a major addition to the building or doing a major renovation on the building. There are excellent Christian consulting firms that provide this support. They make a staff person available to work with your team. They have basic plans that build a teaching piece into the process of your campaign. They have references available to show that they have been very successful in their support of congregations through these journeys. They receive payment from the proceeds that they help to generate. At one time, many of them based this on a percentage. Now, more often there is a basic fee contracted as part of the signed agreement. But, you may not realize that the ELCA has a similar resource available to congregations. They make a staff person available to your congregation. They are able to provide similar biblical teaching resources as part of the journey. They have references available to show that they have been very successful in their support of congregations through these campaigns. But, their payment is at a much lower rate and based on the size of one’s congregation. The work that they do with a congregation is built around five phases: 1) Pre-work; 2) Planning weekend; 3) Program time; 4) Commitment weekend; 5) Follow-up. I know that this resource is helpful. I experienced it in my time as a parish pastor. I hope that this also is something that you keep in mind. One never knows when it could be just the thing your congregation is looking for! Below is an article recently provided through the Stewardship of Life Institute (SOLI) that is based at Gettysburg Seminary and is used with permission. You can learn more about SOLI at their website: www.stewardshipoflife.org. That’s true in many congregations, but it’s possibly because pastors and leaders talk about stewardship only in the context of fundraising, pledging or making the budget. The solution is not to find other words, fresher words -- words that have no baggage, but rather to use stewardship more widely, in non-financial contexts as well. That way people will learn what their pastor learned in seminary: That stewardship affects every decision we make. First some basics: A steward is someone who is entrusted to the care and use of property or things that belong to someone else. Stewardship is the responsible care and use of that property. Christian stewardship starts with the twofold proposition that 1) all we have and all that we are belongs to God, and 2) that God expects us to care for and use those gifts responsibly and for the good of others. And obviously, God gives us much more than just money. Make a list of the blessings God has given to you. It starts with life itself! You breathe, think and are because God has given you life. Included on the list are faith, salvation, love, health, intelligence, wisdom, eyesight, hearing, smell, touch, family, friends, church, freedom, security, joy, comfort, peace and relationships. How about that? List your special talents, things like music, mechanics, cooking, plumbing, laundering, raising children, landscaping, singing, sewing, dancing, teaching, preaching, accounting, writing, running, playing a sport, remembering, cracking jokes, caring for the sick, listening, punctuality, understanding. You get the idea. Now list the things God gives us in our environment, including air, water, wind, weather, rain, clouds, sun, moon, stars, forests, trees, streams, rivers, animals, sky, morning, evening, deserts, mountains, trees, glaciers, oceans, rivers, lakes, prairie and beaches. How about that list? We haven’t even gotten to money yet, and it’s already pretty long. Now start with your economic possessions: a job, house, car, furnishings, clothing, computer, TV, electronics, food, medical insurance, books, land, retirement plan and, finally, money in the bank. All of these things are gifts of God to you, to me and all of humanity. We are entrusted with their responsible care and proper use. Stewardship is how we live as followers of God. Since every decision involves something that really belongs to God, every decision is a stewardship decision. Got it? So, in your congregation, is “stewardship” becoming a just a synonym for “give money to the church”? The remedy is to broaden its use. Make every sermon and every newsletter message a stewardship message. And after a while, people will stop averting their gaze, holding onto their wallets and finding something else to do whenever you mention the "S" word. The Stewardship and Financial Support Committee is sponsoring again this year a special stewardship training to provide a Steward for Stewardship for every congregation in our synod. The second of this year’s workshops will be held on September 28, 2013 from 9:30 AM to 2:30 PM. The Rev. Dr. Blair Morgan, our Director for Evangelical Mission, will be our presenter. The location will be St. John’s of Highland Lutheran Church, 311 Cumberland Road, Pittsburgh, 15237. The only cost ($8.00 per person) will be for donuts, fruit, & coffee as you arrive and a catered lunch . You may send one person, a team of lay persons, and even the pastor is welcome to accompany them if she or he so chooses. You can come to this even if you missed the first one in April! To register, contact Pastor Morgan, at the Synod Office, by e-mail at (blair.morgan@elca.org) or by phone at 412-367-8222 by September 20. Over 60 congregations have participated in this training and have provided us with feedback about how helpful they have found these workshops toward strengthening their stewardship ministry. We hope you will join us. The 10-10-80 Principle of money management has been lifted up in different contexts over the years. I have a DVD in my collection of resources that was developed as a resource for Middle School Students to learn this principle of money management at an early age. It is entitled “10-10-80: Empowering Steward Leaders.” I would be glad to lend it to anyone who would like to see more of what it has to offer. I would imagine that many of us really have no idea what percentages we are currently using in these three areas. In fact, there is likely a whole host of us that are saving nothing for the future, offering whatever we have available in the week that we actually worship and living from paycheck to paycheck with supplemental borrowing through the use of credit cards. Sometimes it just takes a resource from which to work to lead us into a better approach toward some aspect of our lives. It may be something we hear in a sermon. It may be something we read in the Bible or some other book. It may be something we heard in a conversation or on television. 10-10-80 can be this kind of resource for you as you work with your finances and consider your future goals. It may even be a goal to work toward where you start at whatever level is currently being embraced and look to move year-by-year toward the goal of 10-10-80. This 10-10-80 principle is simple and worth considering as one looks to live faithfully in every area of our lives. It is said that Luther spoke of three conversions necessary, “the heart, the mind and the purse!” His sense was that the purse was the last conversion to which we open ourselves. How is that “conversion of the purse” at work in your life? Your congregation recently received a stewardship resource from the church-wide offices in Chicago to help you develop a year-round plan for stewardship training. It is entitled Stewards of God’s Love. Its cover is light brown with pictures from congregational ministry in the form of a cross on its front. It is spiral bound. Please get this resource into the hands of someone who is responsible for stewardship in your congregation! It is organized into four major sections entitled: Down, In, Out and Annual Financial Response. · Down provides ideas and teaching around the truth that God comes down to us. We need to grow into the realization that stewardship arises as the calling of discipleship in response to what God has done for us. It starts with appreciating, realizing and responding to that FACT of God’s grace and love. · In provides ideas and teaching around the truth that God is at work within us that we might become everything we have been created to be. We are stewards of all that God has provided. We need to learn how we might best use the abundant gifts that God has provided in us and for us. · Out provides ideas and teaching around the truth that we are not just called to love our God, but also to love our neighbors as ourselves. Thus, all that God provides for us is meant to lead us into the lives and needs of our neighbors. The Parable of the Good Samaritan would be a helpful example of this truth. · Annual Financial Response provides ideas and teaching around the fact that vital congregations encourage giving to and through their congregation for the ministry of the Gospel. Each congregation may do this with its own style, but there are basic resources that have worked in countless congregations across the country. These ideas are shared. Some additional material is provided to help you. It includes some guidance around how to evaluate what you did in stewardship education over the past year. It provides some suggestions as to what to do when you are falling short of your annual budget. It gives suggestions as to how you might work with the people of your congregation to consider giving from alternative funding streams. It even has a pocket in the back with additional Key Stewardship Resources in a handy one-sheet format that can be pulled out of the booklet. If you have questions regarding any of the ideas or approaches that are suggested here, I am freely available for consultation. I can work with individuals on the phone or meet with teams or committees at your church buildings. Just give me a call at the Synod Office (412-367-8222) or e-mail me at blair.morgan@elca.org. From time to time I highlight for you articles that I have found helpful around stewardship. Below is one from Pastor Charles “Chick” Lane. I found it through the monthly e-mail service that he provides through Luther Seminary’s Center for Stewardship Leaders. You can subscribe to this service and receive monthly stewardship articles by going to www.luthersem.edu/stewardship. "As I have worked with congregations, I have often experienced a large knowledge gap between the leaders and the regular worshipers. The knowledge gap is about the specifics of the congregation's ministry. Leaders usually have a pretty good knowledge of the congregation's ministry, both within the congregation and outside the congregation's walls. Many regular worshipers are in the dark about these specifics. Obviously, infrequent worshipers know even less. Does your congregation have a plan that guides how you tell your own members about the congregation's ministry? If not, I'd suggest that you develop one. The plan doesn't have to be elaborate. You might pick one ministry each month that you will highlight. One month it might be the Sunday School. The next month it could be your work through the local food shelf. The third month could be a ministry you support across the country or around the world. Pick twelve, one for each month of the year. As you pick ministries for each month, keep a balance between ministries in the congregation, ministries in your community, ministries that you support directly around the country and the world, and the ministry of your denomination. Next, you could think of all the communication opportunities that are available to you. The old reliables, such as talks in worship and bulletin inserts, still work. You might also think about using video projection in worship, email blasts, Facebook and much more. It is important that your plan uses a variety of media. This should ensure that as many people as possible receive your message. Third, incorporate your congregation's mission statement in your telling. Hopefully the ministry you are doing reflects the priorities described in your mission statement. Make this connection clearly so members understand that what you are doing as a congregation grows out of what you have decided God is calling you to do. Finally, I'd like to suggest a couple of phrases you might use. "Because of you..." has been used in lots of places. It works, and makes it clear that the congregation is able to do ministry because of all congregants giving of their time, talents and treasure. A second phrase I like is "Look what you have done now." My friend Pastor George Haynes shared this with me. Every time I hear it I think of times when my mother said this to me when I was growing up. She got my attention with this phrase, and it still gets my attention. A congregation could turn the phrase into a positive way of getting people's attention and then telling the good news of the congregation's ministry. 2. Near the top, just below the words “God’s work. Our hands.,” there are six choices and then the CAMPAIGN FOR THE ELCA box and a GIVE box. The six choices are: ABOUT; FAITH; INTERACTIVE MAP; RESOURCES; NEWS AND EVENTS; and OUR WORK. 3. Place your mouse’s cursor over RESOURCES. A Drop Down Box appears and in the far left column you will see two more choices come up in blue: Downloadable Resources; and Items to Order. 4. Click on Downloadable Resources. 5. You will arrive at a page with over 50 categories of possible resources that could be useful to a congregation. BUT, you are looking for Stewardship and so you scroll down alphabetically to the Stewardship category and click on it. 6. There you will arrive at a page with around 100 stewardship resources. The heading for this page is Leadership – relating to those who seek to provide stewardship leadership in the life of a congregation. There are also near the top of that page additional choices for more stewardship resources in other categories. 7. Click on each of those other categories (Care Creation; Lifestyle; Managing Finances; and Spiritual Gifts) and you will find additional stewardship resources relating to those categories. 8. Any problems or questions regarding these resources? E-mail your Director for Evangelical Mission, Pastor Blair Morgan, at blair.morgan@elca.org. Or, call me at the synod office at: 412-367-8222. I have found the Center for Stewardship Leaders at Luther Seminary in St. Paul, MN to be a helpful resource for articles and events that strengthen my understanding of stewardship. Pastor Charles “Chick” Lane is the Director for this center. We had Chick here in our synod as our first Stewards for Stewardship training and he did a great job. Below is an article by Grace Duddy, the Assistant Director, that addresses the importance of stewardship of time. You can find these types of articles at their website: www.luthersem.edu\stewardship. "A few years ago I visited Peace Lutheran Church in Tacoma, WA as part of a research team from Luther Seminary. One of the members of Peace that we met was also staff at the community center housed within their congregation. When asked what stewardship looked like in his life, the man said that he chooses to give the resource that is hardest for him to give, and at that point in his life, it was time. At the dawn of a new year, I find myself harkening back to that statement and wondering, “What is the hardest resource for me to give? What would it look like to give that first? What resource is most difficult for me to steward?” As I have reflected on these questions, I have the same answer as the man I met in Tacoma. The hardest resource for me to give and to steward is time. Don’t get me wrong, I volunteer for various organizations, including the church. But I still have this underlying belief that my time is mine to keep, to use, to organize or even to waste. There is a dichotomy between the time that I give away, or give to God, and the time that I have for myself. Yet, doesn’t God care about how I use all of my time, not just the small percentage that I give away to worship, fellowship, spiritual practices and volunteering? Like money, time is one of the many resources that God has entrusted to my care to serve both God and my neighbor. In 2014, I do not want to focus solely on the ways that God is calling me to give my time away to the church, but how God is calling me to use all of my time to share God’s love and grace with the world. What is God calling me to do with all of my time on earth? How is God calling me to use my time to live into my many vocations: leader, fiancée, daughter, friend, Christian, neighbor, etc.? I am continually struck by the story of the Good Samaritan in Luke chapter 10. I am convinced that this story is one of the best examples of what stewardship of your whole life looks like. What I find most striking about the story is that the Samaritan stops his journey, on a long, dangerous road, for the sake of his neighbor. He doesn’t consider the time, his destination or his to-do list. Instead, he comes near the beaten and robbed man, sees him and is moved with compassion. This compassion alters the course of his entire day. He gives away his day to a stranger in need out of love and compassion. As a person who organizes almost every day on a post-it note, this is a shockingly high-calling. What does it look like to be available to love your neighbor even when it isn’t convenient? What does it look like to live my life by the small tugs of the Holy Spirit rather than my clearly written to-do list? I resolve this year to listen closely to the ways that God is teaching me how to be a better steward of all of my time and helps me living into my Christian calling at all hours of the week, not just Sundays." The Stewardship and Financial Support Committee is yearly sponsors special stewardship training to provide a Steward for Stewardship for every congregation in our synod to meet this exact need. This training enables these Stewards to be equipped to faithfully and successfully lead the stewardship ministry in a local congregation. This can be one person or a team of persons from each congregation – the more the merrier! In the past three years, more than 120 people and 60 congregations have found this training to make a difference in their congregational stewardship journey. Our spring training event always focuses on the biblical support for stewardship. Pastor Blair Morgan, our Director for Evangelical Mission, will be the presenter that day. He will provide the biblical connection between stewardship and discipleship and share how this important connection can be encouraged in the life of a congregation. Pastor Morgan did his Doctor of Ministry project on discipleship in the local congregation and has many years of experience in teaching and encouraging discipleship in the life of a congregation. The workshop will be held on April 5, 2014 from 9:30 AM to 2:15 PM. The location will be Good Shepherd Lutheran Church, 4503 Old William Penn Highway, Monroeville, PA 15146. Please note that this is a different location this spring than we have held all of the other training events. We hope that this change might make it more accessible to different corners of the synod. Good Shepherd is right off the PA Turnpike Monroeville exit. The only cost for this event will be for a morning pastries and fruit, as well as a catered lunch (suggested donation $8.00). You may send one lay person, a team of lay persons, and the pastor is welcome to accompany them if she or he so chooses. To register contact Pastor Blair Morgan at the Synod Office by e-mail (blair.morgan@elca.org) or by phone at 412-367-8222 by Wednesday, March 26. May has been declared a Mission Month in our synod as we seek to approach a long-time plan for giving in a new way. The Calendar of Causes emphasis has evolved into Faith Works - a two-year pilot project. Faith Works is a new way to connect with and financially support Lutheran ministries that are meaningful to you. In 2014 and 2015, we will have two months (May and October) in which we emphasize giving through Faith Works to ten different ministries that have been involved in Calendar of Causes in one way or another for many years. These ten are: Bethesda Children’s Home; Camp Agape; Gettysburg Seminary; Glade Run Lutheran Services; Lutheran SeniorLife; Lutheran Service Society; Lutheran University Center; Lutherlyn; Synod Mission Support; and Thiel College. These 10 ministries are working together to share their mission stories with the people of the congregations of the Southwestern PA Synod. Faith Works brochures have been produced that provide basic information regarding each ministry. They are being mailed to every congregation in our synod in amounts that can be put in bulletins on a Sunday in May. These gifts are opportunities to give over and above one’s regular offering into the life of your congregation. Each congregation has handled the former process of Calendar of Causes in its own way. We hope that this new process will enable the special story of these Lutheran ministries to be shared in a way that expands the visibility of all of them. Please embrace this new emphasis and prayerfully consider how you might participate in and support Faith Works. Our current process for applying these offerings begins with the synod sending on 47.5% of what is received from each congregation as Mission Support to the Church-wide offices in Chicago for the ministry we live out through the ELCA’s Church-wide structure. The other 52.5% of what is received from each congregation in Mission Support is used for the ministry we live out through the synod. The 47.5% is the key funding resource for all of the ministries of the ELCA. This includes ministry that supports local congregations as they are established. It supports others as they work on renewal of mission and ministry (providing resources and leaders in areas of worship, education, social ministry, stewardship, evangelism, and congregational administration). It includes our mission outreach for the gospel through mission personnel across the world. It includes strengthening our relationships with other denominations ecumenically and conversations we have with other faith traditions. It includes our committed and effective outreach to those experiencing poverty, hunger, violence, disease and disasters around the world (including the work of our many social ministry organizations). It includes the preparing, recruiting, educating, and supporting the leadership of our church – clergy and lay. It includes the support of youth and young adult ministries across our church. It includes ongoing research, planning, and evaluation of the ministry of our church as we seek to take the Gospel into the world. It includes the coordination, support and administration of these ministries as we are governed and constituted as the Evangelical Lutheran Church in America. The 52.5% is the key funding resource of the ministries of our synod. This includes the ministry of our bishop and the synod staff – providing support in pastoral vacancies, congregational challenges, congregational celebrations, and mission discussions. It includes the committees, teams and our Resource Center that address congregational needs in areas of ministry, education, evangelism, worship, pastoral leadership, stewardship, communications, ecumenical relationships locally, and the encouragement of global missions. It includes our ability to provide some financial support and certainly our ongoing partnership with our Lutheran camps, agencies and institutions. What happens when a congregation makes the decision to cut Mission Support? The ministry of the church is immediately hampered by this lack of support. It starts with less ministry being possible because funding is reduced. It moves from there to people not being hired to fill positions that supported these ministries previously. It finally moves to the elimination of additional positions and committed, faithful people no longer being available to support the mission and ministry of the church. Mission Support is the lifeblood of the mission and ministry of our church. No amount of specified giving to individual ministries – creative and prayerful as these attempts may be – can make up for what the open offering in faith is able to accomplish in Mission Support. That is what happens to those Mission Support dollars and why they are so essential to full ministry that we do together as the Evangelical Lutheran Church in America in our synod, across the country and across the world. The Stewardship and Financial Support Committee is sponsors special stewardship training to provide a Steward for Stewardship for every congregation in our synod to meet this exact need. This training enables these Stewards to be equipped to faithfully and successfully lead the stewardship ministry in a local congregation. This can be one person or a team of persons from each congregation – the more the merrier! This September we will welcome Keith Mundy, head of Stewardship Ministries for the ELCA. Keith will work with us to learn about resources for planning an Annual Stewardship Campaign, developing a Year-Round Stewardship Program and even where one might turn for Capital Campaign help. This event will be held on Saturday, September 20, 2014 from 9:30 AM to 2:30 PM at St. John’s of Highland Lutheran Church, 311 Cumberland Road, Pittsburgh, 15237. The only cost is to cover a lunch and doughnuts and fruit as you arrive in the morning and that suggested amount is $8.00. A basket will be made available that morning at the church for this offering. One of the best books available on congregational stewardship ministry is Ask, Thank, Tell : Improving Stewardship Ministry in Your Congregation by Charles R. Lane, Augsburg Fortress, 2006. I like the way that Charles “Chick” Lane uses the first half of the book to emphasize that stewardship is about discipleship. Then, the second half of the book is very practical in its suggestions and guidance around the “How to’s” of congregational stewardship ministry. One of the essential areas that Chick lifts up is “Thank.” I wonder sometimes how often we miss opportunities to be thankful in the context of our congregations. Here are some tips from the book (the quotes are directly from the book between pages 104-7) that I hope inspire you to greater thankfulness and to taking another look at this special stewardship resource. Plan your thanksgiving > Some people have a particular gift for noting who needs to be thanked, but most of us need to include it in the planning of any event and especially our stewardship work. Build the thank you's into the planning process. Expand the circle of thanks-givers > Pastors need to understand how important their thank you's are, but each leader needs to be encouraged and guided in the importance of giving thanks to those who have participated in aspects of the ministries they oversee. Thank everyone at the same time > There are times throughout the year when a general thank you to a large group of people is appropriate and important. Never lose that opportunity. Pass on thank-you's > “From time to time your congregation will receive thank-you's from other ministries you support. … Pass these thank you's on.” Read them in worship announcements when appropriate. Share them in the bulletin or newsletter. Post them on a bulletin board. In an effort to connect giving with discipleship and faith practices, the focus of Try-A-Tithe Sunday is to invite and encourage each household to grow toward a tithe, to a tithe and beyond a tithe as they have been blessed. This may begin with a designated Sunday each quarter (i.e., the first Sunday) or a designated Sunday each month (i.e., the second Sunday). In the latter case, a household would give the usual offering on the 1st, 3rd, 4th and 5th Sundays, then on the second Sunday, Try-A-Tithe Sunday, households are invited to step up in faith and give 1/10 of their weekly income to support God’s work through their congregation. · On TRY-A-TITHE SUNDAY, the 2nd Sunday each month, they are invited to “try tithing” which in this family’s case would be giving $100 for that one week. Note this giving of a tithe is intended to be additional giving for the year, not to be offset by lower giving in later months. When introducing this to the congregation, it may be helpful to have a Proportionate Giving Chart available, especially on the day you designate Try-A-Tithe Sunday. Q. 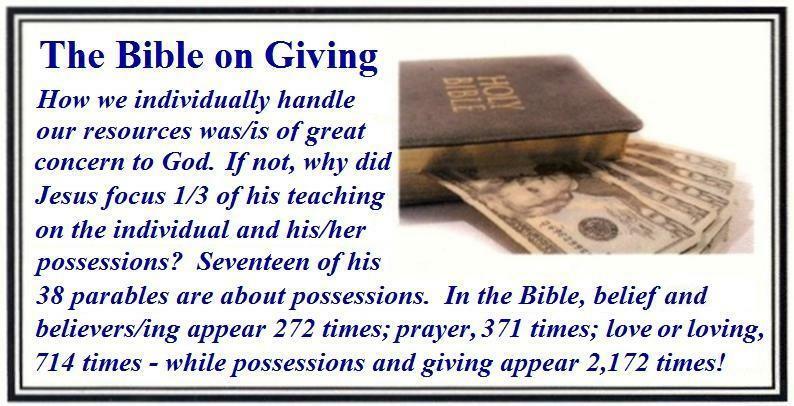 What is biblical tithing? A. In general, biblical tithing refers to the practice of giving one tenth of one's income for the work of God. In the Hebrew Bible, tithing was understood as a response of gratitude and an obligation. In the light of the New Testament, some Christians believe tithing is still an obligation, whereas other Christians understand tithing to be a loving, freely chosen response to God's gracious provisions for life - God's grace! Tithing is understood by many Christians to be an important discipline of one's faith life. Q. When one tithes, is the tithe on gross or net income? A. There is no definitive answer to this question. One must choose the method that most adequately fulfills the intention of the person or household who tithes. It has been reported that many persons who file income tax returns use their Adjusted Gross Income as the base figure. This decision is clearly in the hands of the giver, and it is the faithful giver who responds generously. We had a great Stewards for Stewardship training on September 20. Keith Mundy, head of Stewardship Ministries for the ELCA was very well received. The irony for me are the comments I receive like: “I wish I could get more people here.” Also, “Why don’t more congregations take advantage of this?” Will you be there next year? We will continue this training in 2015. Please look for the dates through the ECHO. The Stewardship and Financial Support Committee has heard a concern across our synod for a resource to help people work through their financial matters faithfully. In congregational ministry, we become aware of people who are facing huge debts around multiple commitments – housing, automobile(s), schooling, and further purchasing decisions that may have seemed appropriate or worthwhile at the purchase, but have become a burden through the payments. All of this is lived out in the context of stewardship. We live and learn as Christians around the teaching that God has provided everything that we have. We try to understand how to “steward for God” rather than “own for ourselves” all that we oversee faithfully and responsibly. Some of us have had good models for that in our growing up years. Some of us have had poor models of that. We also know that people face difficult financial “surprises” in their lives. This may be unemployment. This may be a health event that changes one’s financial needs. This may be an addition into family life of one sort or another that adds to the financial requirements. AND/OR, this can also be a positive increase in a person’s or a family’s financial situation. A raise may come. A bonus may come. A new job with full benefits and significant growth in salary may come. An inheritance may come one’s way. Even the possibility of the current cultural classic American financial dream – one could win the lottery! Could we offer a resource into the teaching context of our congregations that would help our people in these situations? Could we help them work through their financial needs and priorities in a systematic way? Could the faith journey and the trusted context of the church be exactly the kind of offering that people would be willing to try as they know they need direction? This may be something that would take some time. It may require offering it even if just a few people respond at first. But, we are finding that this is a need across our churches. We have sent five people for training to use a resource that provides this type of a helpful process in personal finances. They will be offering this training for anyone in our synod that would be interested in learning. We are calling this training: Toward A More Faithful Personal Journey With Money. It is being held on Saturday, November 22 from 9:00 AM to 3:30 PM at The Good Shepherd Lutheran Church, 4503 Old William Penn Highway, Monroeville, PA 15146. The cost for registration and participation is $20. This includes a Participant Book, morning coffee and rolls, and lunch. You may advertise this in your congregation and send people who are interested. OR, you may come and learn the process, and then, once you have been through this training you will have the option of using the resource to offer training in your own congregation. OR, you may invite our trained people to come and work with people from your congregation or a group of congregations. To register call the Synod Office at 412-367-8222 and talk with Pastor Blair Morgan OR e-mail him at blair.morgan@elca.org. 1. Respond gratefully - to what God has first given us. All that we do is a response to God’s grace. Everything we are, have, and use comes from God. Best of all, God gives the gift of Jesus Christ and the community of believers. It all begins with God. Our confession of faith in Jesus Christ as our Lord and Savior is not of our doing. Grateful stewards put God first. 2. Obey responsibly - to glorify God as a faithful proclamation of God’s word. We acknowledge our faith and show our faith in the gospel for the glory of God and for the building up of the body of Christ. This takes courage. It involves our life-long obedience, including the ways we treat our families, others, and ourselves. 3. Sacrifice proportionately - as Christ sacrificed for us. For our sake Jesus gave up everything to make us rich through the cross and the resurrection. We are called to sacrifice so others may share in God’s word and blessings. 4. Give willingly - as moved by the Holy Spirit. We have been prepared to give of ourselves. We give our time, talents, and resources freely. 5. Share abundantly - as we have received. The purpose of these gifts is for the good of the community of God. We give to build up the body of Christ. We use and share our gifts for the benefit of all. 6. Give proportionately - is our way of giving in relation to our abundance. We are to give according to our “means,” not according to an income or a budget. 7. Commit intentionally - means making a statement about your intent and following through. As members in the body of Christ, we are asked to make a commitment of our time, talents, and resources as a faithful response to God and as a statement of support for God’s work. 8. Contribute regularly - means practicing our stewardship on a daily basis. By doing so this becomes a lifestyle. 9. Live genuinely - means putting your faith into action. This is the tangible demonstration of what is sincerely on our hearts and where our treasure is, not simply a verbal expression. The Macedonians set an example that Paul called to the attention of the Corinthians. 10. Accept a challenge - means recognizing the dynamic nature of our faith. As our faith grows so will our blessings, and our responsibilities. This is also available on the website as a bulletin insert. 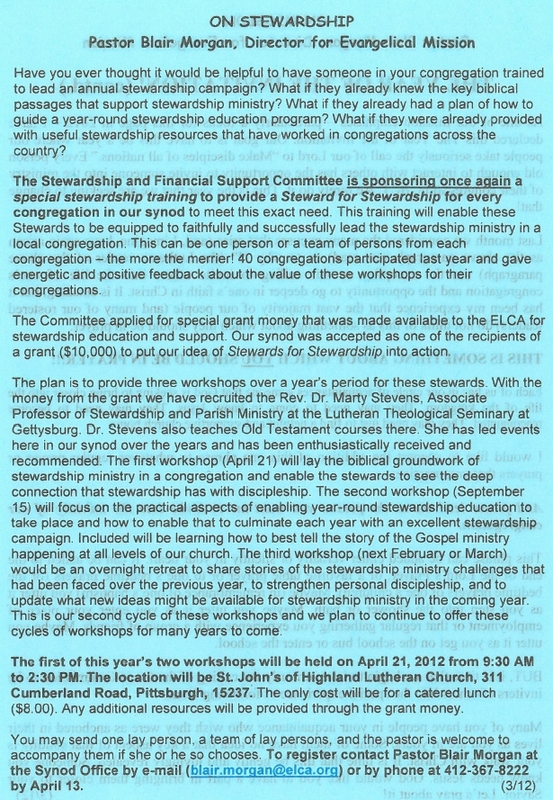 Many stewardship resources are available for you at www.elca.org. Choose the Resources tab and go down to Stewardship. There are plenty to look at and use for free! We often talk about being called to be stewards of God’s love. By definition a steward is a manager, but is that really the highest aspiration that God has for us? Have you thought about the difference between a manager and a leader? A manager is a person that is about following the rules, taking care of the status quo and keeping the existing processes going. A leader on the other hand is a person that has a vision for a reality that is different than the here and now. A leader works with others to inspire them to see other possibilities. A leader changes things and makes a difference in the world. Whether we lead in our families, neighborhoods, jobs or congregation, isn't that what God is calling us to be about for the sake of the gospel? Here is a different approach to thinking about stewardship: God created every one of us on purpose and to make a difference in the world. Great leaders like Jesus or Martin Luther King, or pastors you may have known, aren’t the only ones who lead lives that matter. We all have a unique role to play as leaders in making the kingdom of God emerge “on earth as it is in heaven.” Our unique role is based on how God made us, the skills, talents, experiences and passions that make up who we are. Our calling in life is to be disciples of Jesus and this calling is about all of who we are, and all of what we do. Our ability to make a difference is a function of all our gifts and possessions, including how we make, spend, save and give away money. God wants us to be able to look at our lives and to know that we matter, we have a purpose and our decisions and choices make a difference as we proclaim God’s love. P.S. Help us grow our network! Be sure to encourage others who would benefit to subscribe to stewardNet by visiting www.ELCA.org/growingstewards. The Stewardship and Financial Support Committee is yearly sponsors special stewardship training to provide a Steward for Stewardship for every congregation in our synod to meet this exact need. This training enables these Stewards to be equipped to faithfully and successfully lead the stewardship ministry in a local congregation. This can be one person or a team of persons from each congregation – the more the merrier! In the past four years, more than 200 people and 60 congregations have found this training to make a difference in their congregational stewardship journey. Our spring training event always focuses on the biblical support for stewardship. Pastor Blair Morgan, our Director for Evangelical Mission, will be the presenter that day. He will bring his energetic approach to working from resources newly drawn from synods and congregations across the country as they have been developing new ways to tell the biblical story of stewardship. Thus, this will using the same Bible as always (obviously), but drawing from new resources on how it has been used! The workshop will be held on April 18, 2015 from 9:30 AM to 2:15 PM. The location will be St. John’s of Highland Lutheran Church, 311 Cumberland Rd., Pittsburgh, PA 15237 (McCandless). The only cost for this event will be for a morning pastries and fruit, as well as a catered lunch (suggested donation $8.00). In 2014 and now again in 2015 we will have two months (May and October) in which we emphasize giving through Faith Works to ten different ministries that have been involved in Calendar of Causes in one way or another for many years. These ten are: Bethesda Children’s Home; Camp Agape; Gettysburg Seminary; Glade Run Lutheran Services; Lutheran SeniorLife; Lutheran Service Society; Lutheran University Center; Lutherlyn; Synod Mission Support; and Thiel College. These 10 ministries are working together to share their mission stories with the people of the congregations of the Southwestern PA Synod. Faith Works brochures have been produced that provide basic information regarding each ministry. They have been mailed to every congregation in our synod in amounts that can be put in bulletins on a Sunday in May. There are three common ways that giving takes place in congregations – Regular Giving, Special Giving and Planned Giving. Strengthening each of these avenues for support of a congregation’s ministry and mission is something every stewardship team should consider. Regular Giving is the most common way that congregations encourage support for their ministries. But, I have found that many congregations do very little to encourage growth in this type of giving. Thus, we offer training through our Stewards for Stewardship events to help individuals or teams to receive help in strengthening how to provide year-round education for stewardship and to conduct an annual campaign for your congregation. Many congregations have allowed a negative experience in the past to keep them from trying to do this in a better way in the present. It is worth the effort to work through whatever is blocking your ability to encourage your people to prayerfully consider how they might increase their regular giving to the mission of your congregation. Special Giving is a wide array of opportunities to donate to special causes. This could be specific ministries within the life of your congregation that are either off budget or some surprise has created a need to ask for additional support. Certain property repairs fall into this category – roof, boiler or furnace, flooding, and needed remodeling could qualify. Sometimes youth trips or mission trips come into this category. Sometimes there are causes and/or needs within the families of the congregation (health or accident events) or in the local community that the congregation chooses to lift up a needed response. This would also include the support of Lutheran causes – our agencies and institutions, disaster relief, and hunger relief – would apply. Some congregations create a monthly schedule with an envelope in their box of envelopes to encourage this type of giving. Our synod is lifting up a way to twice a year (May and October) provide opportunities for giving to our local agencies and institutions through a project called Faith Works. An organized and informed approach to this area tends to encourage better response than a haphazard, catch-as-catch can approach yields. Although, some emergency just need to be taken on as they arise. Finally, there is Planned Giving. This is the area that encourages people to include the ministry of your congregation in their wills. Few congregations and pastors have adopted any kind of regular encouragement for this area of giving. Yet, it is an important way to provide long-term support for the life of the congregation and its mission. It is an area that everyone tends to have good intentions about strengthening, but the subject leaves the actual development of a plan always out into the future and often with nothing ever getting done. Some of the greatest stories of financial impact on ministry arise around this area of giving, and yet it is the one that is most neglected. It is simple enough to include from time to time a short article in your newsletter with the question – Do you have a written will or are you just going to allow the laws of the state to provide for how your estate will be handled? Have you considered including our congregation in your plans? This is just a reminder that supporting the work of your congregation is important. Putting together a plan as to how you could strengthen your approach to each of these areas could make a real difference in how your mission receives support. It is worth thinking, praying and working on it. Every once in a while I think it is important to repeat an article that is essential for us to consider and that may have been missed. Thus, I share this one around making sure one has a will. I know of cases where a small gift of a thousand dollars or two has made a difference. I know of cases where gifts of hundreds of thousands or more than a million have made a difference. It has happened recently for our synod. The time has finally come to DO something about it. Creating a plan for your estate, whatever its size, is good stewardship. The time has come because your time is certainly coming. We are always looking for stewardship resources around this time of the year - or even a little sooner, I hope! Our synod’s Stewardship and Financial Support Committee provided just such a resource to every congregation at the synod assembly. Mailings went out later in the summer to those who did not pick up the booklet at the assembly. For three years I wrote these emails promoting stewardship ideas for congregations. It is a bit odd to be writing one promoting a stewardship program that I have written. Yet, that is precisely what I am doing. I’m pleased to introduce Because of God’s Great Mercy to you. Because of God’s Great Mercy is a stewardship response program designed to be used in congregations of any size and any denomination. It is an online resource, easily found at www.embracingstewardship.com. Five words describe Because of God’s Great Mercy. First, it is complete. Everything you need for your congregation’s stewardship program is included. Instructions and a timeline will guide your program. Emails and letters, a newsletter article, bulletin inserts and talks in worship, a commitment card and follow-up materials are all included. Second, it is biblical. God’s word is at the heart of Because of God’s Great Mercy. Congregants are invited to reflect on God’s word and respond to God’s incredible generosity with generous gifts to the congregation. Third, it is missional. The congregation is encouraged to use the program as an occasion to tell how giving is making a difference in Jesus’ name in the congregation, the community and around the world. People are encouraged to give to do God’s work in the world through the congregation. Fourth, it invites proportional giving. The program encourages people to grow their giving by ½ of 1 percent of household income, and gives them a very simple way to calculate that amount. In two simple steps, anyone at any income level can determine what increasing by this amount would be per week. A third simple step converts this amount to twice monthly or monthly giving. Fifth, it is customizable. Because of God’s Great Mercy comes in two formats. A Word format is completely customizable, allowing the congregation to easily insert its name, its mission story and its ways people can give. A .pdf format is ready to go. If your congregation is one of the many that conduct your stewardship response program in the fall, and you haven’t decided what program to use, I encourage you to consider Because of God’s Great Mercy. Unlike some stewardship programs that require you to make many choices about how you will use them, Because of God’s Great Mercy provides complete instructions, and requires only slight editing in the Word version so that you can make the program your own and use it to tell the story of your congregation’s mission and ministry. There is still plenty of time to be ready for a fall program. Because of God’s Great Mercy costs $20.00. You receive both the Word version and the .pdf version. For more information and to purchase the program, go to www.embracingstewardship.com. Why is it that congregations are encouraged to do an Annual Stewardship Campaign? · It is an opportunity to remind your people of the positive ministries happening through your congregation. Often the temptation in stewardship campaigns is to go directly to costs of ministry – salaries, health insurance, utilities, materials for education, etc. Maybe not so surprisingly, this kind of approach does not generally inspire giving! What can inspire support for your ministries is sharing stories of what is being accomplished because you are there. Choir members sharing the blessing they experience from singing together songs of faith. Sunday school teachers sharing the blessing of leading disciples – young and older – in their learning new aspects about their faith. Social ministry outreaches that share ways that lives are being touched because of the ministry happening through your congregation. I have heard people say about their congregations that they are one of the best kept secrets in their communities. Sometimes we are secrets because we have not provided enough great stories for our people to share – and by which to be inspired for support with their time, their talents AND their treasures. · Annual campaigns provide our people an opportunity to focus their attention on what they are giving and what they might PLAN to give. One year can just go on into another in the lives of our people. Therefore, what they are giving can just become a habit that does not change because no one has asked and brought attention to it. Also, if we do not educate and challenge our people around the percentage that they give to the mission and ministry, we will continue to see them allow themselves to put a very low value on their giving. We need the opportunity to encourage our people to think first about what they give to God and encourage that this giving be a significant part of any spending plan in their household. It should challenge their priorities and encourage a rearrangement on what else their spending. Annual campaigns help to do this. Year-round stewardship education is also important for this. · Annual campaigns strengthen the spiritual journey of a Christian disciple. The Bible teaches Christian disciples the importance of giving beyond ourselves. Jesus actually said, “For where your treasure is, there your heart will be also.” It is appropriate, even essential, for Christian disciples to be encouraged to think about how they are spending their money. So, please keep in mind that the work that is done in your congregation on year-round stewardship education and an annual stewardship campaign is important faith training. It is not about getting your congregation’s bills paid. It is about enabling your congregation’s ministry to make a difference in this world for the Gospel in the lives of your people and your neighborhood. An Annual Stewardship Campaign is important ministry for any congregation. I have recently been working with three statements in presentations around stewardship. It’s not membership, it’s discipleship! More and more in the experience of our congregations, we need to see that what we must be focusing upon is discipleship – following Jesus Christ. When we get too caught up in a traditional sense of church membership, we mislead ourselves into thinking that the most important thing is the local organization itself. Discipleship renews us in the calling to follow Christ. It inspires us to see that we are more effective in that journey together than we can be separately, but it is all about our journey together in Christ. In that perspective, buildings, locations, traditions all become tools toward living out our calling. It’s not ownership, it’s stewardship! Our culture promotes an understanding that values ownership – what we own, what we have that belongs to us. When we own it, it is under our control. This is a foreign biblical understanding to our calling to steward our lives and all that we have for they belong to God. Stewardship changes our priorities about possessions. We end up asking more and more: What would God have me do with this? How might I use my time, my talents, and my treasure with God’s reign in my life in mind? Luther reminds us in the Small Catechism’s explanation to the First Article of the Apostles’ Creed: “God daily and abundantly provides shoes and clothing, food and drink, house and farm, spouse and children, fields, livestock, and all property.” God provides. We use it all to God’s glory and God’s purpose. It’s not accumulation, it’s distribution! Again, our culture often measures what we are worth by how much we have – our accumulation of worldly goods. The more wealth I have, the more I am worth. The more power I have, the more successful I am. The more famous I am, the more special I am. Yet, Jesus is quoted in Acts 20:35 that “It is more blessed to give than to receive.” It turns out that it is not how much we have, but what we do with what we have that matters. Distribution is more important than accumulation. As we follow Christ, we look for ways to make a difference in the lives of the people we encounter. The love, mercy and grace of God are meant to come alive in our everyday experiences with the world. What we give matters more than what we receive. This all falls under the larger realization of the Gospel at work in our lives. These are not ways that our salvation can be earned. These are ways that we live out the salvation that has already been accomplished for us in Jesus Christ and his life, death and resurrection. Recently, we placed on the Southwestern Pennsylvania website many of these articles that have been written by me over the last six years around mission and stewardship. You may access these Microsoft Word documents by going to our website: www.swpasynod.org, and clicking on “Resources,” “Mission and Stewardship Tools,” and then following the links to the lists of articles. Or, here is a direct link to the main Mission and Stewardship Tools page: http://www.swpasynod.org/resources/mission-and-stewardship-tools. Click the live links on that page for the various resources you are interested in. There are 46 articles around stewardship under six categories and 54 articles around mission under six categories. As you look for ideas to share with a committee or for articles to include in your newsletter, I hope this library of articles proves helpful to your mission work! Several years ago I was preaching to a group of pastors at a retreat. In the sermon, I repeatedly referred to the countless gifts we have received from our loving God. I remember being very careful to use the word gifts to make sure there was no confusion about the fact that we live by the gracious hand of God, not from our own accomplishments. Later in the retreat I was in conversation with Pastor Harry Wendt, president of Crossways International. Harry was one of the speakers at the retreat. In his gentle, direct way, Harry suggested that I should be careful about using the word gift. He said that God doesn’t give gifts, at least not in the way we use the word gift. He went on to point out that when we use the word gift we imply that one person has given something to someone else, who then owns that item and is free to do with it as they please. He concluded his observation by saying that this is not the way it is with God and us. God continues to own everything. Of course, Harry was correct. When we give a gift to someone, we understand that a transfer of ownership has occurred. Imagine that I buy a gift for my son. After I buy that gift, it belongs to me. I have paid for it. It is mine. Then on a birthday or at Christmas, I wrap that gift (or more accurately my wife does), and give it to him. He unwraps it, thanks me for the gift, and at that point, it belongs to him. I have given up any claim to it. This isn’t the way it is with God and us. No such transfer of ownership occurs. God has created all that is, and God continues to won all that is. Everything we have still belongs to God. We are given the privilege and responsibility to care for that which belongs to our heavenly Father. This biblical truth – that it all belongs to God – is the cornerstone of everything we have to say about stewardship. The very word steward describes someone who watches over that which belongs to someone else. Psalm 24:1-3 > The earth is the Lord’s and all that is in it, the world, and those who live in it; for he has founded it on the seas, and established it on the rivers. If we understand and believe that all that we are and all that we have belongs to God, we approach so much of our lives in a whole new way! How would God have me be about this task, this relationship, this responsibility? A good steward and a good disciple start there! Grace Duddy Pomroy is a millennial stewardship ministry leader. She graduated from Luther Seminary in 2012 with a Master’s of Arts degree in Congregational Mission and Leadership. She served as the Assistant Director of the Center for Stewardship Leaders at Luther Seminary and the Executive Director of Operations for Kairos and Associates and the Joshua Group. She is the co-author of the recently published stewardship book, Embracing Stewardship: How to Put Stewardship at the Heart of Your Congregation’s Life, as well as author of the 2013 ELCA stewardship resource, “Stewards of God’s Love.” She lives in Apple Valley, MN with her husband, Tyler. She is currently the Financial Education Specialist at Portico Benefit Services. I had the opportunity to do a pre-read of Embracing Stewardship. It is a wonderful resource for congregations seeking to be about good stewardship education and ministry. She will have copies available at the training. Also, every congregation has a copy of “Stewards of God’s Love.” The ELCA in 2013 sent out one copy to every congregation. I used this tool in our fall 2013 training and took everyone through this resource on year-round stewardship education. So often we hear from people over 50 in these trainings. This is an opportunity to hear from someone under 40! Our training will again take place on Saturday, April 23 from 9:30 AM to 2:30 PM. It will take place at St. John’s Lutheran Church of Highland, 311 Cumberland Road, Pittsburgh, 15237. The cost is purely a donation to help with the food provided. We will have coffee, donuts and fruit available as you arrive. We will provide lunch. If you would be willing to donate $8 to $10 to cover those costs, it would be helpful. This spring training will particularly focus on the Bible. What passages teach us about stewardship and how do we take what we learn and share it with our congregations? Lay leaders responsible for stewardship, council members and pastors would all benefit from this time of training. Anyone is welcome. Please register so that we know how many to plan for! To register contact Pastor Blair Morgan at the Synod Office by e-mail (mailto:blair.morgan@elca.org) or phone at 412-367-8222 by Wednesday, April 13. At our recent Stewards for Stewardship training, Grace Pomroy shared some interesting information about generational differences in giving patterns. 1. They are moving from paying by check to paying electronically. 2. They are moving from giving out of “duty and delight” to giving based on the mission of the ministry and whether it is making a difference. 3. They are moving from giving to institutions in which they believe to giving to causes in which they believe. 4. Thus, they are moving from giving through congregations to giving through a more diverse pattern of what causes they might want to support. She stressed strongly that there are no easy changes that just tap into this new generational thinking. Like so much of ministry, it is about relationships, openness, honesty and caring. It is important that people hear the stories of what is being accomplished through the ministries of the congregation. These stories inspire all aspects of what we have considered traditional stewardship – time, talents and treasure. This is a quick sharing of just one aspect of our day together. Grace will be back on October 1 to offer our fall Stewards for Stewardship training. I hope you will make sure to attend. Also, we video recorded her session and it will soon be available through the Resource Center – as are all of our other trainings. I have taken this month’s two pages and made it one that is all about stewardship. I wanted to highlight a new book and the fact that one of the authors has been with us in April and will be back with us on October 1. Also, at the end of the article is a website address to view a new video that contains the witness of many people from across the synod about the value of their experiences with our Stewards for Stewardship training. (Page 29) … In many congregations there is a business/spiritual split that puts these two aspects of congregational life in separate boxes and keeps them well isolated from one another. This, of course, is to the detriment of congregational health. Just as what a person does with finances cannot be separated from the person’s faith in Jesus Christ, what a congregation does with finances cannot be separated from the spiritual life of the congregation. 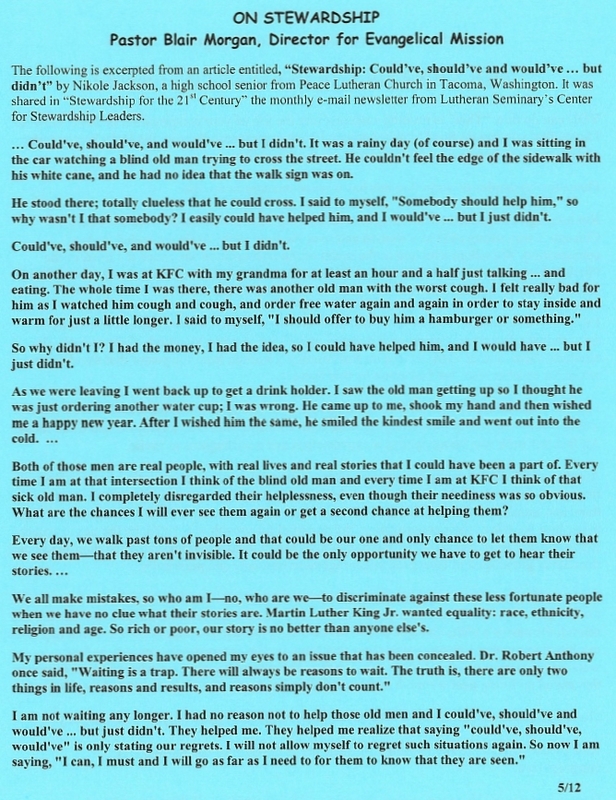 (page 32) I had a fascinating conversation with a man in a congregation in Tacoma, Washington. He was talking about how he understands stewardship as time, talent and treasure. … He said, “I’ve learned that whichever one of these is in shortest supply in my life, that is the one God wants me to give most generously. When I was a college student I didn’t have much money, so I sensed God’s call to me to be financially generous. Now, I have a full-time job, and I’m engaged. I want to spend time at work and with my fiancée, so I now sense God’s call to me to be generous with my time.” Most of us imagine that we should give of whichever of these is in greatest supply. He said it differently, and I think correctly. We should give generously to God what is most precious to us, not what is easiest to give. (page 34) Societal taboos about money are probably not something pastors and congregational leaders can undo. Rather, leaders have to resign themselves to the occasional backlash when money is openly discussed. It is important to keep this problem in mind, because it may well be the explanation for that time when someone’s reaction to money talk seems way out of proportion. The reaction may not be about you. It may be about the societal taboo, and there isn’t much you can do about it except to listen quietly and not overreact. (page 35) Consumerism impacts how people hear the message of stewardship in many different ways. Two are especially important. First, if my life is at one level or another an unending question for what I don’t have, it makes no sense to give money away. … The second impact is even more important. Many people have responded wholeheartedly to the message of consumerism and have already purchased many things that they are still paying for. … All of these previous financial decisions impact a person’s ability to give of time, talent, and treasure. (page 36-37) It used to be that stewardship ministry in congregations was pretty much “one size fits all.” … You may have noticed that this is no longer the way it is. Most congregations offer a variety of ways for people to give and realize that they should probably be expanding the options even more. More and more congregational leaders are realizing the message that reaches baby boomers (think “Chick”) is probably not going to reach Millennials (think Grace). Newcomers to most congregations are in many cases not coming from another similar congregation. Rather, they are coming from years of no church involvement and need help learning the basics of church life, including how and how much to give, and how and how much to be involved. The rest of the book is all about how to take on these challenges and enable stewardship work to be meaningful, inspiring and effective in the life of a congregation. We try neither to imply that stewardship ministry is easy with no challenges, nor imply that the challenges are not able to be met. Stewardship work is an essential congregational ministry that is deeply tied to the discipleship of each person in the congregation. Your congregation can do this. We can help! We offer Stewards for Stewardship training in our synod each year in three different sessions. In the late winter, we offer an overnight retreat at Lutherlyn for people involved in stewardship ministry in their congregations to be renewed in their own discipleship, to learn a little bit more around congregational stewardship ministry, and to share with each other your congregation’s stewardship journey – its ups and downs. In the spring, we offer a Saturday training event that runs from 9:30 AM to 2:30 PM and is focused on the biblical support and guidance for congregational stewardship ministry. In the fall (this year on Saturday, October 1 at St. John’s of Highland Lutheran Church, 311 Cumberland Road, in the North Hills from 9:30 AM to 2:30 PM), we offer practical congregational stewardship training. One can learn insights into year-round stewardship education and annual stewardship campaign work. Grace Pomroy, mentioned as one of the authors above, will be our speaker on October 1. She spoke this past spring to rave reviews. I hope that you will look at that time as a key opportunity to strengthen the stewardship ministry of your congregation. If you need additional encouragement, there is actually a short 5-minute video on the synod website that has people from across the synod sharing their appreciation for what they have learned and how their congregations have benefited from Stewards for Stewardship over these years. Please check it out at this address: http://www.swpasynod.org/stewardship-testimonies. There are two important training events coming up in October that we hope you will attend. Grace Duddy Pomroy will be back with us on October 1, 2016 to provide additional stewardship training for our Fall Stewards for Stewardship event. Grace’s spring Stewards for Stewardship training was very well received. This fall training will be more specifically focused on how to go about year-round congregational stewardship education and how to do an annual stewardship campaign. It has been great to have a speaker who is from the millennial generation to provide a younger perspective on our work in stewardship. So often congregations talk about wanting to be more appealing to the younger generation and yet rarely actually communicate with younger people and discern what they are looking for. Now you will have a speaker who can share aspects of that perspective as she works with us around practical congregational stewardship matters. This is for pastors, council members, lay leaders responsible for stewardship, Sunday school teachers and anyone else interested in the subject. We have a video that shares about the value of Stewards for Stewardship from both those who have attended and those who have led it. It can be seen on our website at this address: http://www.swpasynod.org/stewardship-testimonies. It will be held at St. John’s of Highland Lutheran Church, 311 Cumberland Road, Pittsburgh, 15237 from 9:30 AM to 2:30 PM. The cost is purely a donation to help with the food provided. We will have coffee, donuts and fruit available as you arrive. We will provide lunch. If you would be willing to donate $10 to cover those costs, it would be helpful. If you could call Pastor Blair Morgan at the synod office (412-367-8222) or email him (blair.morgan@elca.org) with your church name, location and number coming by Wednesday, September 21 that would be very helpful. We have heard a concern across our synod for a resource to help people work through their financial matters faithfully. In congregational ministry we become aware of people who are facing huge debts around multiple commitments – housing, automobile(s), schooling, and further purchasing decisions that may have seemed appropriate or worthwhile at the purchase, but have become a burden through the payments. Some have wondered: Could we offer a resource into the teaching context of our congregations that would help our people in these situations? Could we help them work through their financial needs and priorities in a systematic way? Could the faith journey and the trusted context of the church be exactly the kind of offering that people would be willing to try as they know they need direction? This may be something that would take some time. It may require offering it even if just a few people respond at first. But, we are finding that this is a need across our churches. It is being held on Saturday, October 15 from 9:00 AM to 3:30 PM at Our Redeemer Lutheran Church, 105 Gateshead Dr, McMurray, PA 15317. This is just a few miles south of the South Hills Village Mall on Rt. 19 (across from the Bob Evans Restaurant). The cost for registration and participation is $20. This includes a Participant Book, morning coffee and rolls, and lunch. Please register by October 3, 2016. For many, the word stewardship brings to mind one of the following things; an annual campaign used to plan the budget, fundraising to meet the budget, demands or requests for money. Money is the main focus. However, for some, stewardship has come to mean something much more. It has become a way of life. It is recognizing that everything belongs to God and that it is our responsibility and privilege to care for what is entrusted to us. One word; seen from two different perspectives. Why is this? What can church leaders do to help people discover and grow the spiritual aspect of giving? Something has happened to change the perspective from one of money and annual campaigns to one of abundant living for God. People change their minds about something because we have been presented with an alternative that we accept as better. Somehow, sometime, somewhere, we have been presented with something that caused us to see how our gifts and talents could be used to serve God and neighbor. It could have been in a Bible study, in reading an article, in attending a workshop, in hearing a sermon, or in talking with our neighbor about God. There is an abundance of resources available for our use. We are all called to be stewards of God’s creation. Every one of us can find ways to share what has been given to us and can share our story with others. 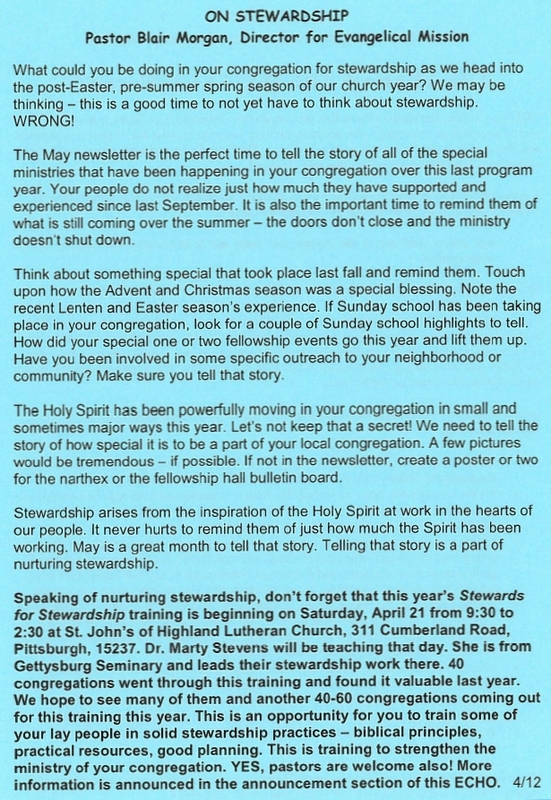 Many churches share a monthly Stewardship newsletter with the congregation. A suggested source of helpful stewardship materials is http://luthersem.edu/stewardship. There are many books on this subject. Two to start with are; Not Your Parents Offering Plate, A New Vision for Financial Stewardship by J. Clif Christopher and Embracing Stewardship, How to Put Stewardship at the Heart of Your Congregation’s Life by Charles R. Lane and Grace Duddy Pomroy. Our synod offers workshops throughout the year, and the Stewardship and Financial Support committee is ready and willing to help. The key is that someone shared a personal story with someone else who accepted it. We have been given the privilege and responsibility to care for what God has entrusted to us. The Bible verse above tells us to “employ” our gifts. That means that we have to do something. We need to determine what gifts we have to offer and how to use them in service to God. In serving our brothers and sisters in Christ, we need to help them realize their gifts and give them opportunities to share these gifts. We are stewards of the Gospel message of grace and we need to share this good news with others. In doing so, we are good stewards of the most precious thing that God has entrusted to our care, each other.